Eight convenient offices; Donaldsonville, Plaquemine, Port Allen, Gonzales, Baton Rouge on Bricksome Ave, Baton Rouge on Picardy Ave, Denham Springs and Zachary. Always accepts assignment of care with your letter of payment guarantee. Clients can be seen within 24 hours. Transportation available for personal injury clients whose vehicles are being repaired. Medical Director available to prescribe medications for your injured clients. Doctors available for testimony when required. We Track your clients' compliance with their care. We can provide you with all notes and a written narrative at no cost within 48 hours of request. We have direct communication with your office with frequent patient updates during treatment. Initial patient forms available for download on our website http://www.imadjusted.com/ to save your clients. Why settle for just Medical Care, just Chiropractic Care or just Physical Therapy? Your clients can experience TOTAL CARE!!! Thank you for visiting the website of Total Care Injury. 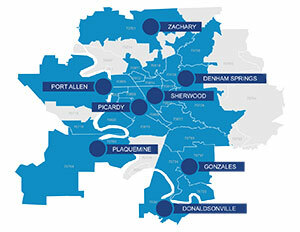 Our team of licensed chiropractors provide chiropractic services in Louisiana for the following areas; Donaldsonville, Baton Rouge, Denham Springs, Gonzales, Port Allen and Plaquemine. In practice as well as online, Dr. Perniciaro and his team of Chiropractors strive for excellence through superior patient treatment, education and satisfaction. Dr. Jay Perniciaro, B.S., D.C.
Dr. Kathryn Kortering, B.S., D.C.
Dr. Richard Harrison, B.S., D.C.
Dr. John Sibley, B.S., D.C.